Corn is native to the Americas. Christopher Columbus first discovered corn in Cuba, and then took it back to Europe. While the United States primarily grows three types of corn, the most commonly recognized variety is the yellowish-colored ears of corn that are commonly eaten off the cob. Regardless of the variety, corn plants have the same basic parts and plant structure. Corn plants have several different parts. The tassel is the male portion of the flower. It sits at the stop of the plant and attracts bees and other insects. Corn stalks are the main body of the plant. Depending on the variety, the stalk can grow several feet high and is quite sturdy. The stalk is fairly stable because it must support the ears of corn. Like any plant, corn plants can have numerous leaves on the stalk. Leaves can be long and typically grow up slightly before curving in a downward position. The silk is part of the female portion of the plant's flower. It grows out of the top of the cornhusk and may be colored green, yellow or brown, depending upon the corn variety. The husk is the green leaves surrounding the corn ears. 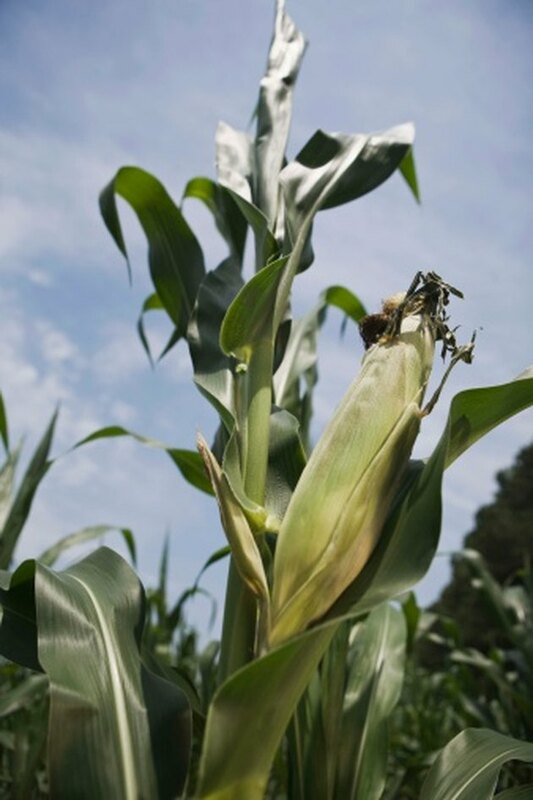 These leaves protect the kernels of the corn, which is the edible portion of the plant. Corn ears encompass the silk, husk, kernels and cob of the corn plant. Harvesting the ears occurs when the plants mature. Corn plants have two different sections of roots. The prop roots grow just on top of the soil while the crown roots are beneath the soil.